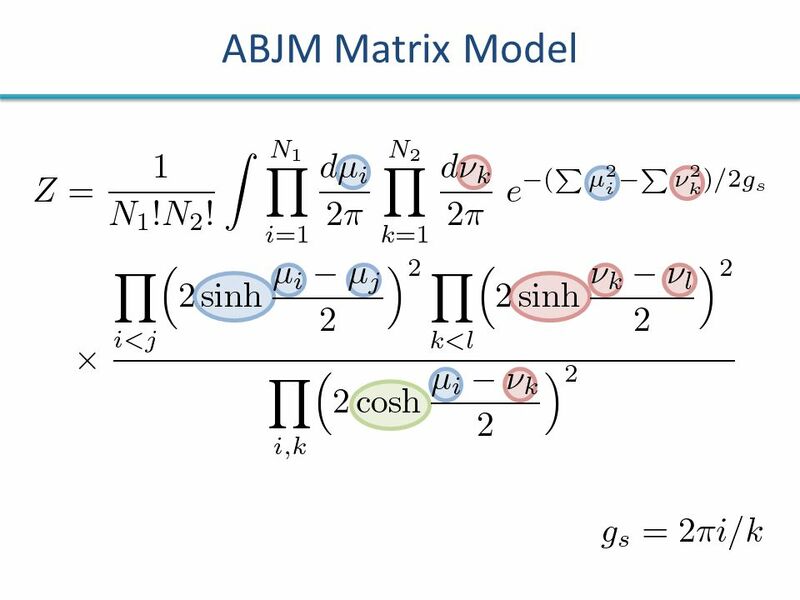 Summing Up All Genus Free Energy of ABJM Matrix Model Sanefumi Moriyama (Nagoya U) JHEP [arXiv:1106.4631] with H.Fuji and S.Hirano. 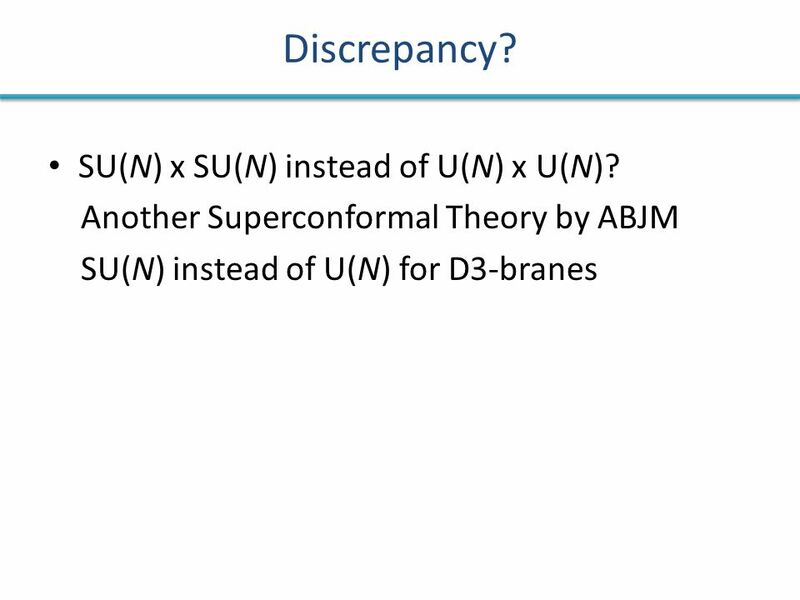 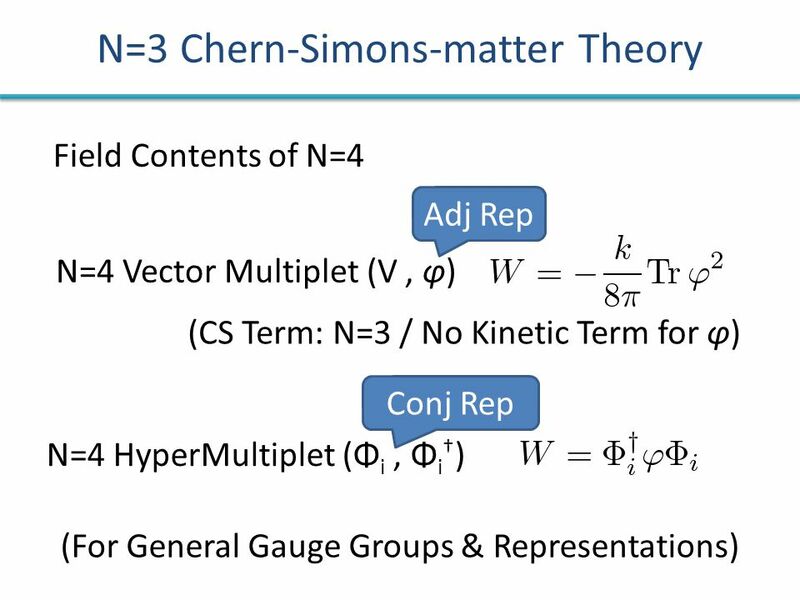 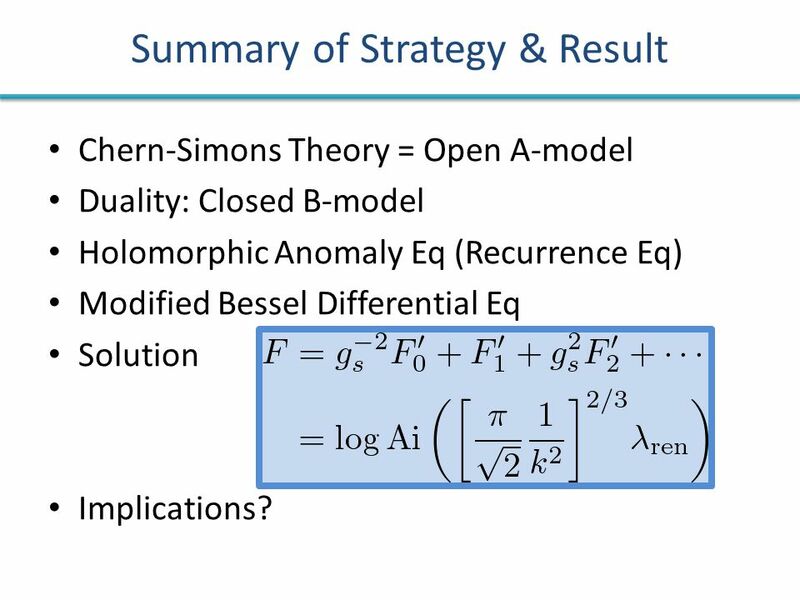 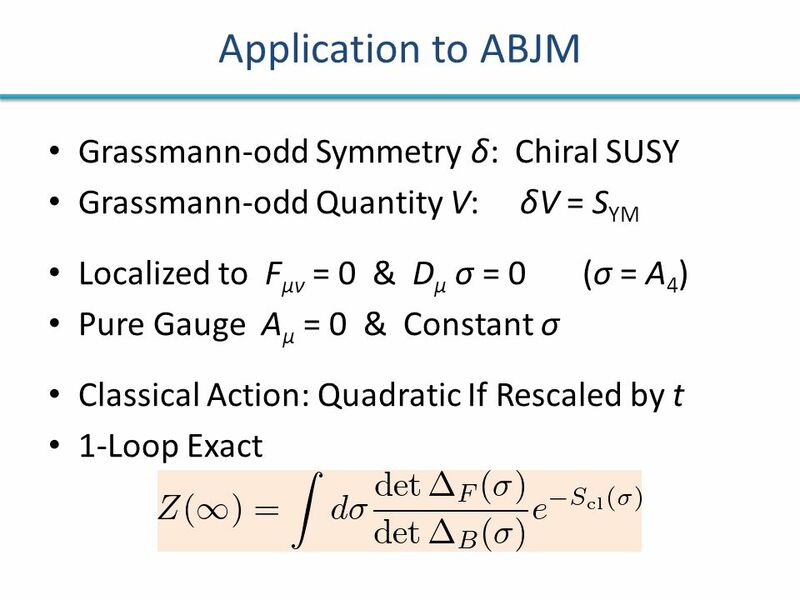 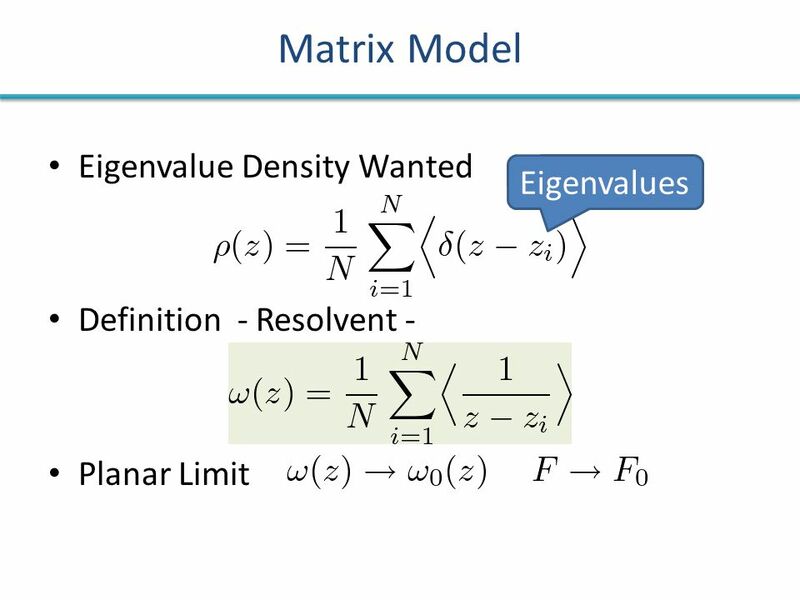 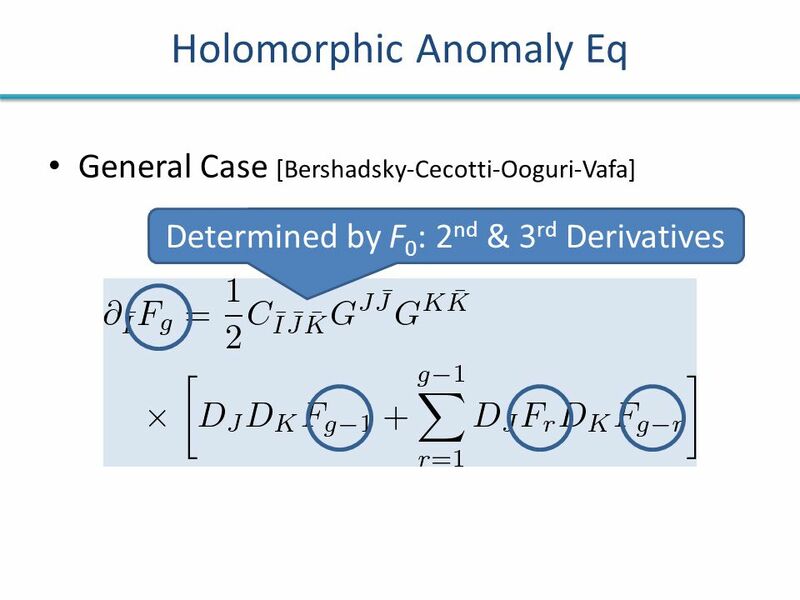 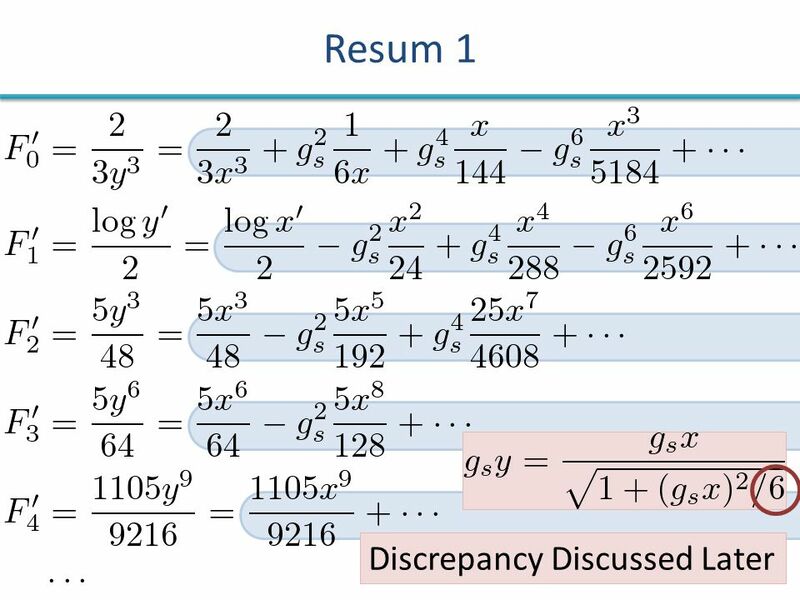 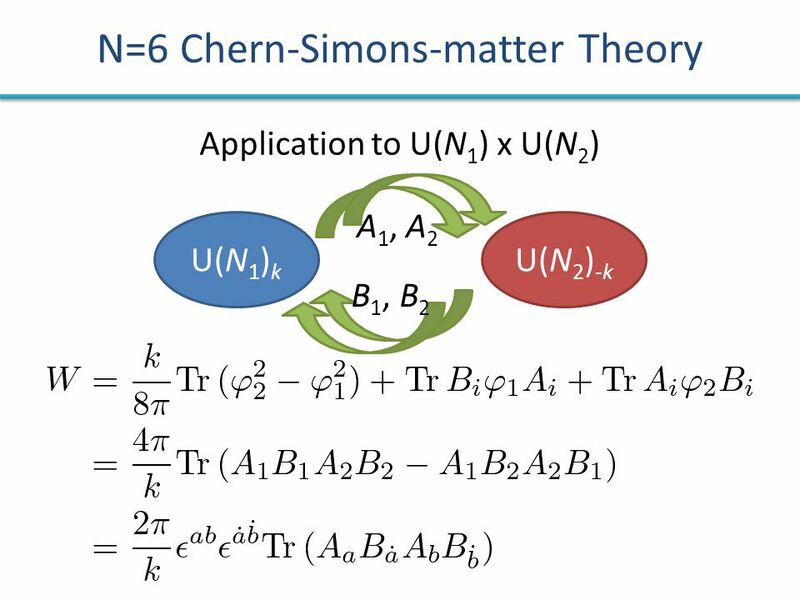 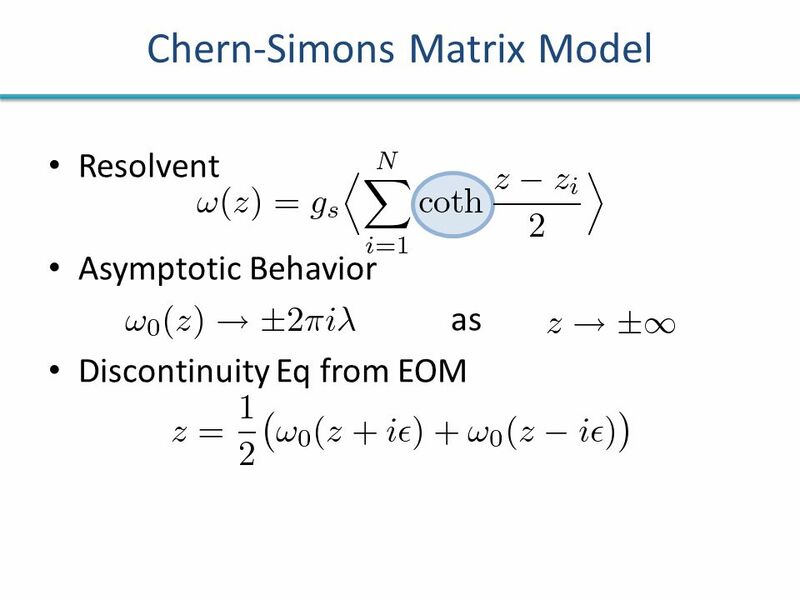 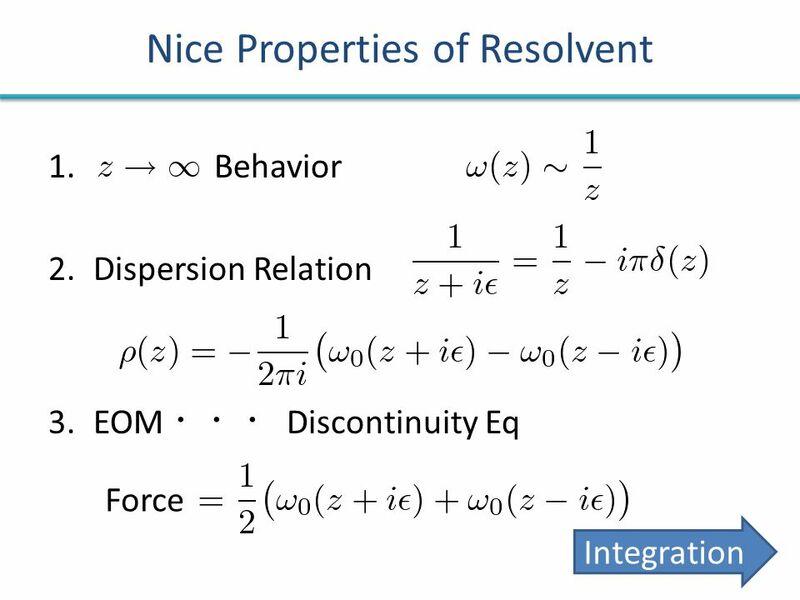 8 Summary of Strategy & Result Chern-Simons Theory = Open A-model Duality: Closed B-model Holomorphic Anomaly Eq (Recurrence Eq) Modified Bessel Differential Eq Solution Implications? 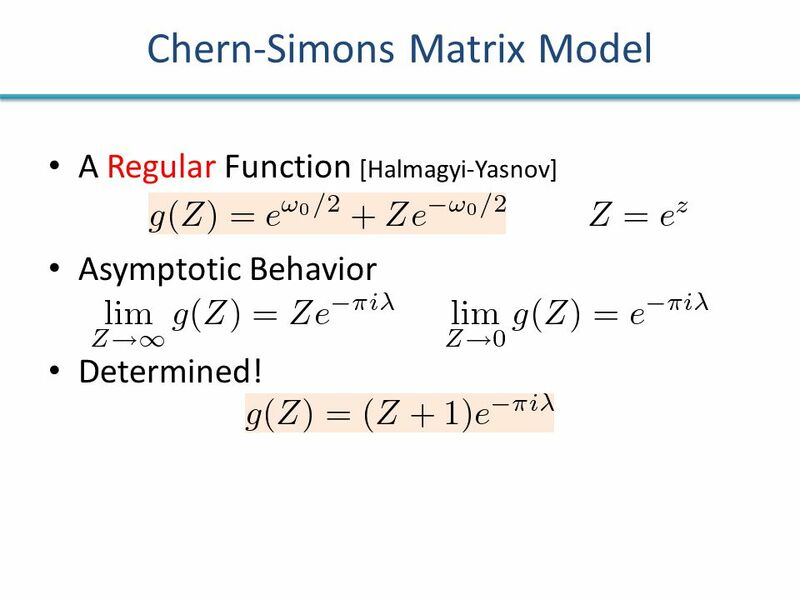 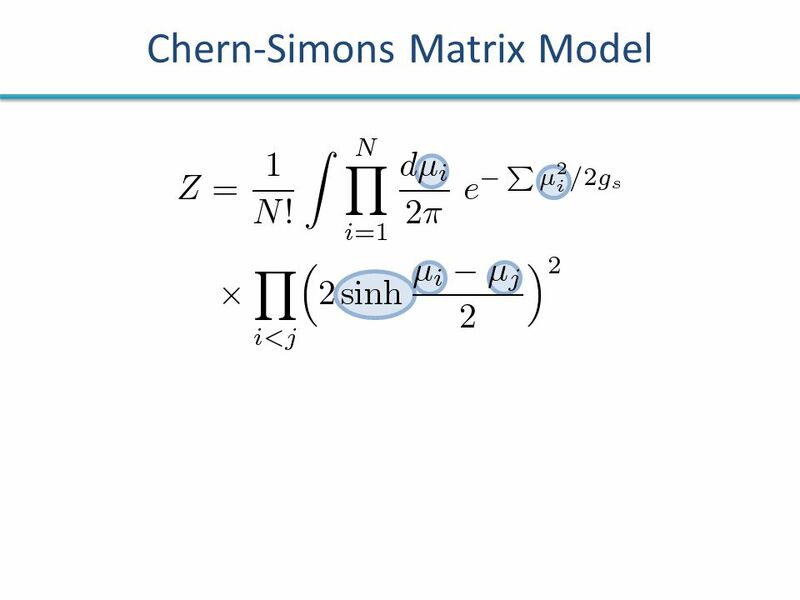 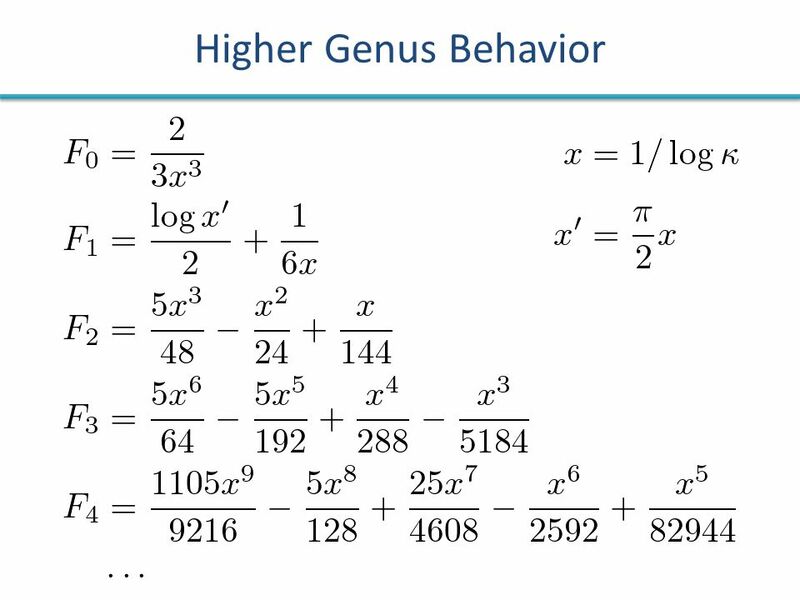 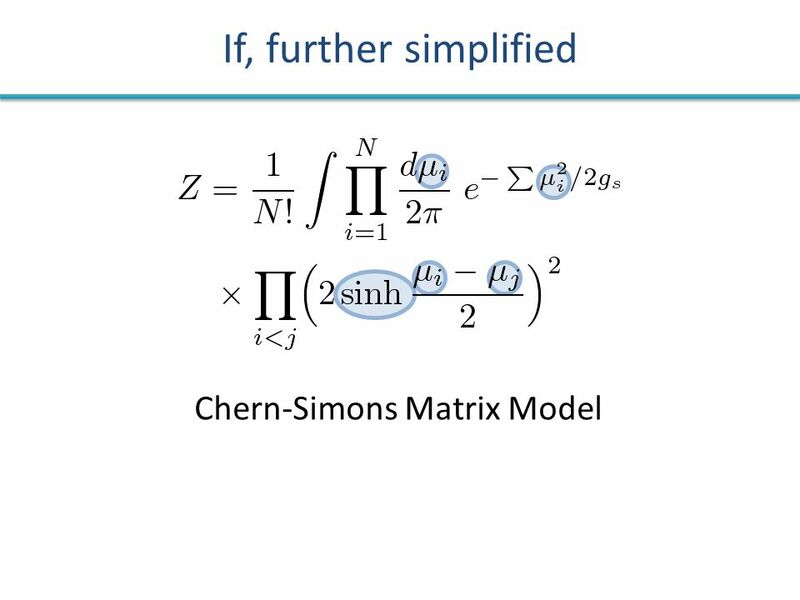 33 Chern-Simons Matrix Model A Regular Function [Halmagyi-Yasnov] Asymptotic Behavior Determined! 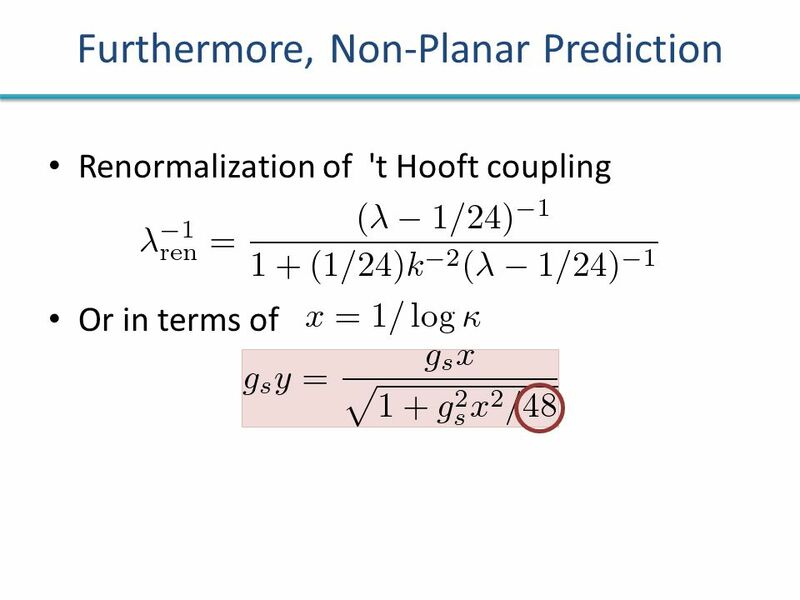 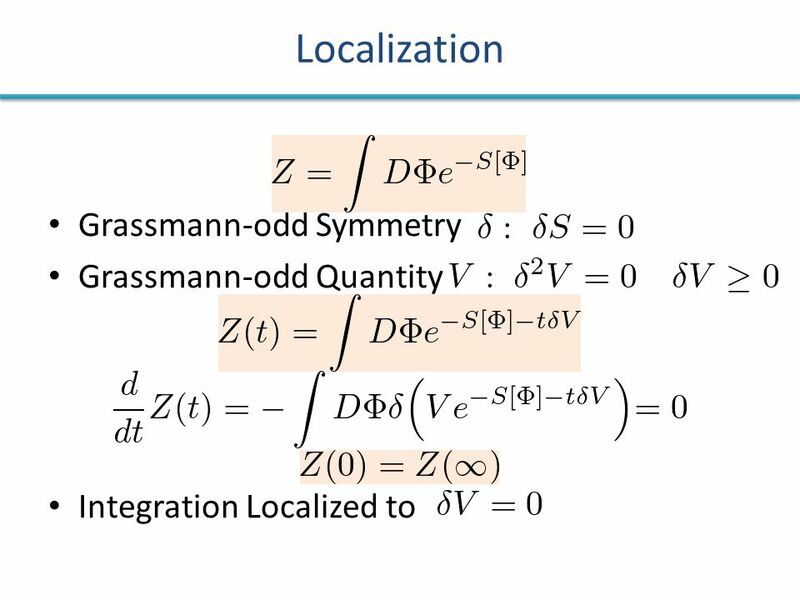 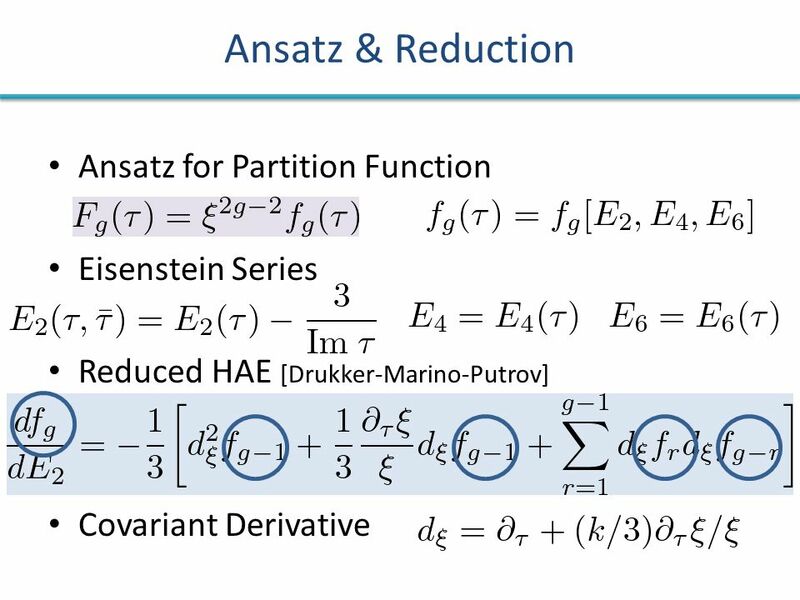 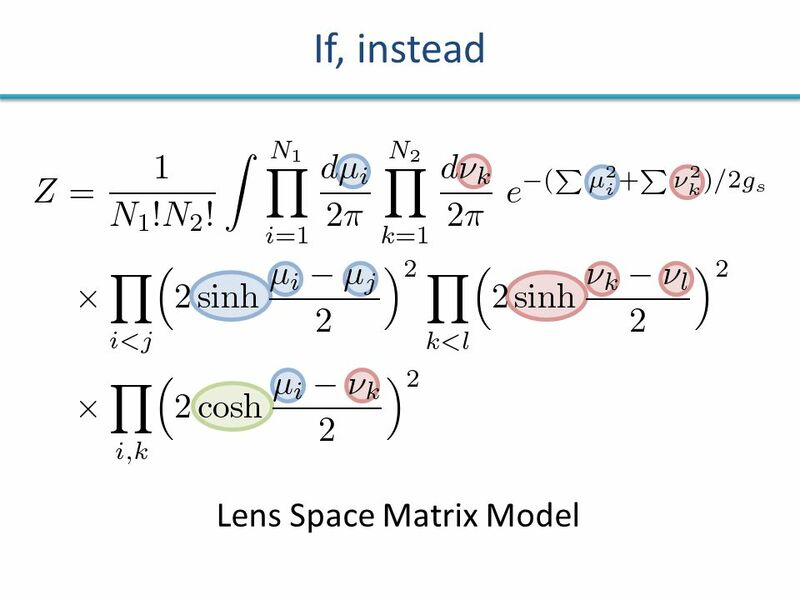 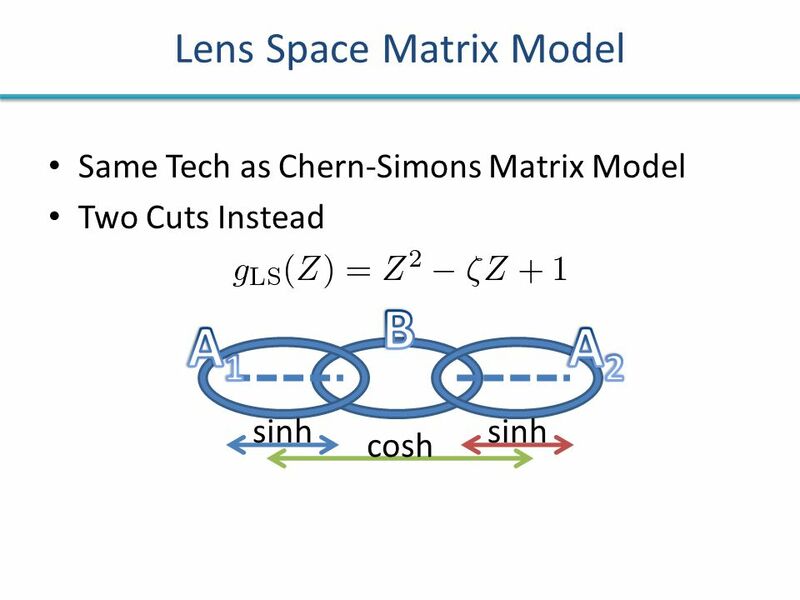 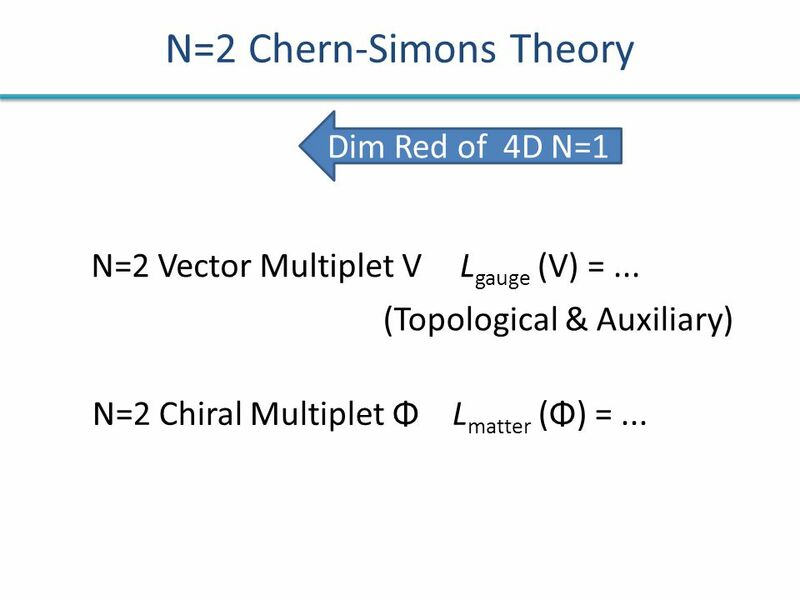 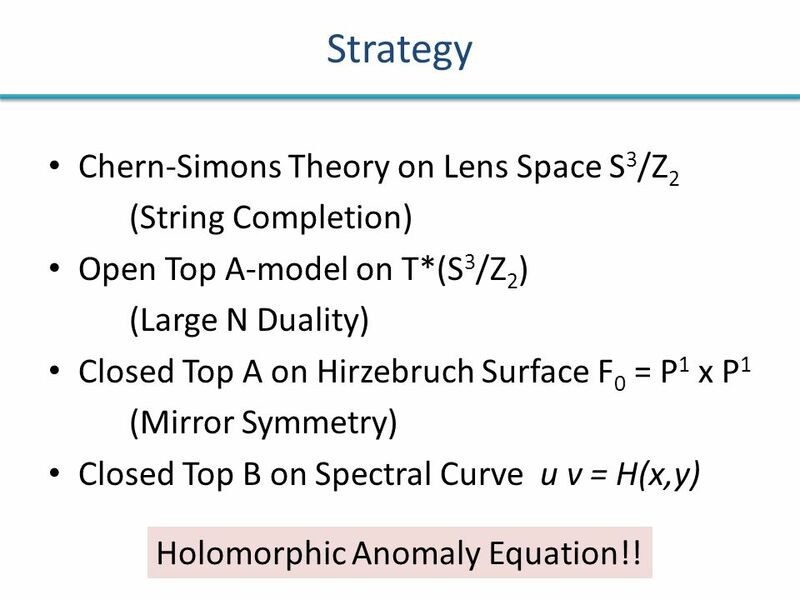 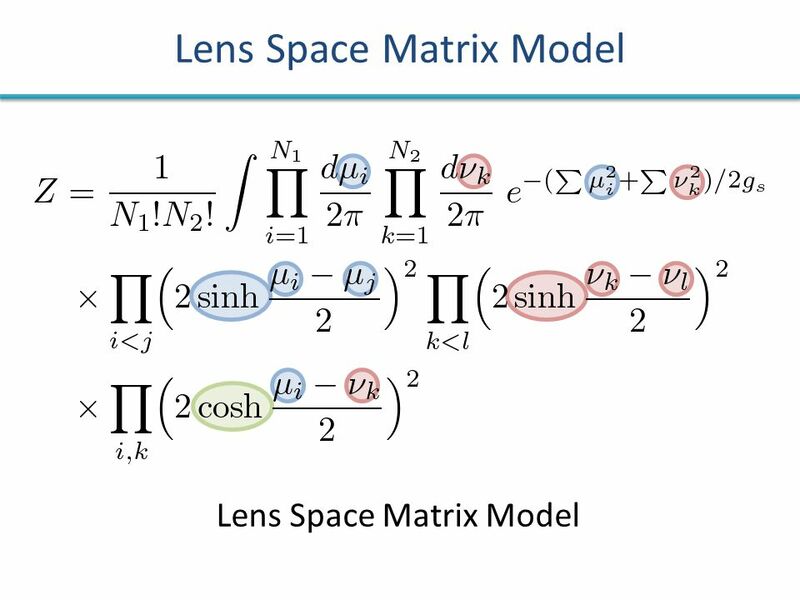 42 Strategy Chern-Simons Theory on Lens Space S 3 /Z 2 (String Completion) Open Top A-model on T*(S 3 /Z 2 ) (Large N Duality) Closed Top A on Hirzebruch Surface F 0 = P 1 x P 1 (Mirror Symmetry) Closed Top B on Spectral Curve u v = H(x,y) Holomorphic Anomaly Equation!! 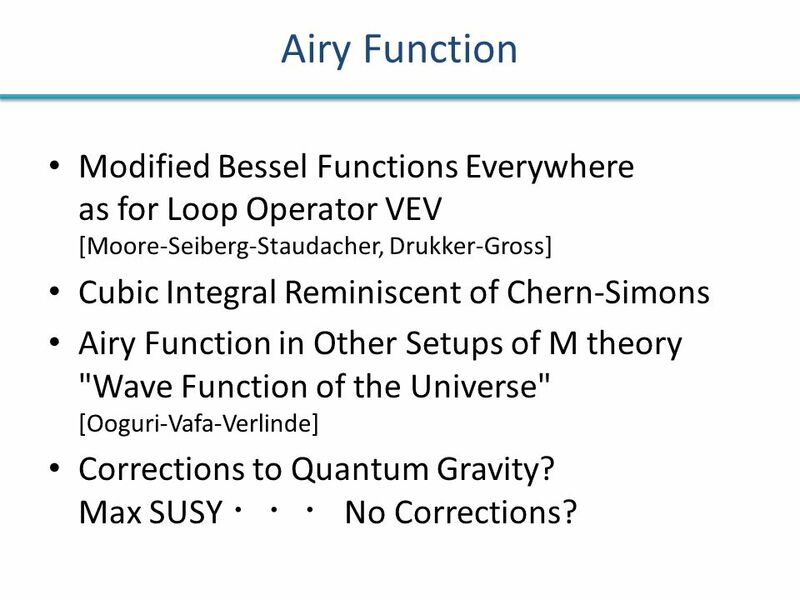 54 Airy Function Modified Bessel Functions Everywhere as for Loop Operator VEV [Moore-Seiberg-Staudacher, Drukker-Gross] Cubic Integral Reminiscent of Chern-Simons Airy Function in Other Setups of M theory "Wave Function of the Universe" [Ooguri-Vafa-Verlinde] Corrections to Quantum Gravity? 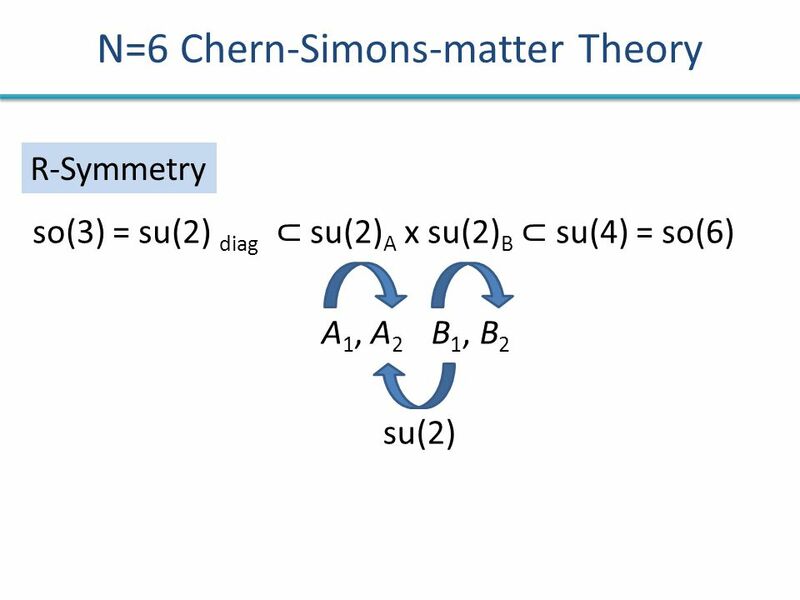 Max SUSY ・・・ No Corrections? 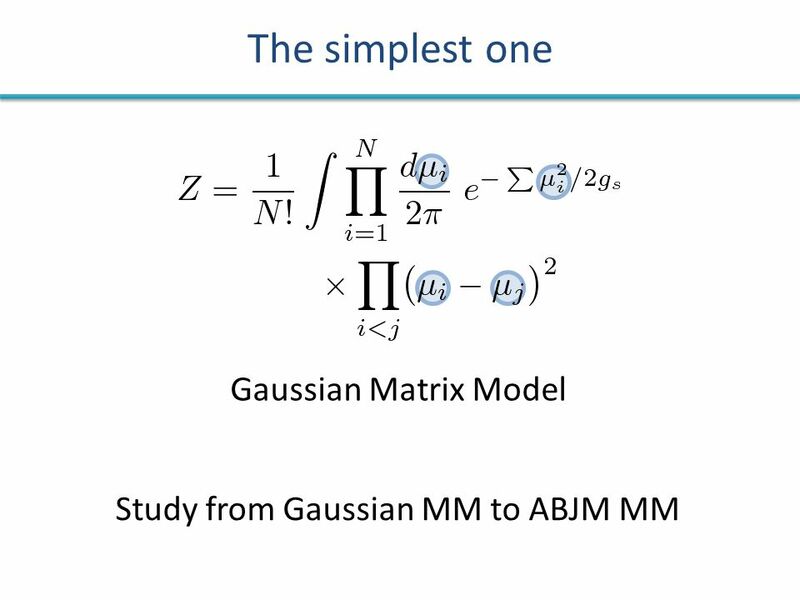 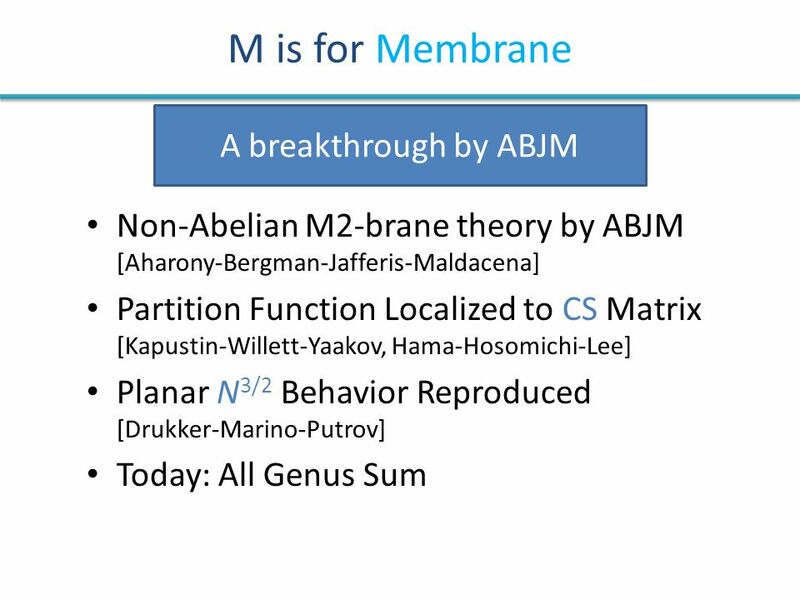 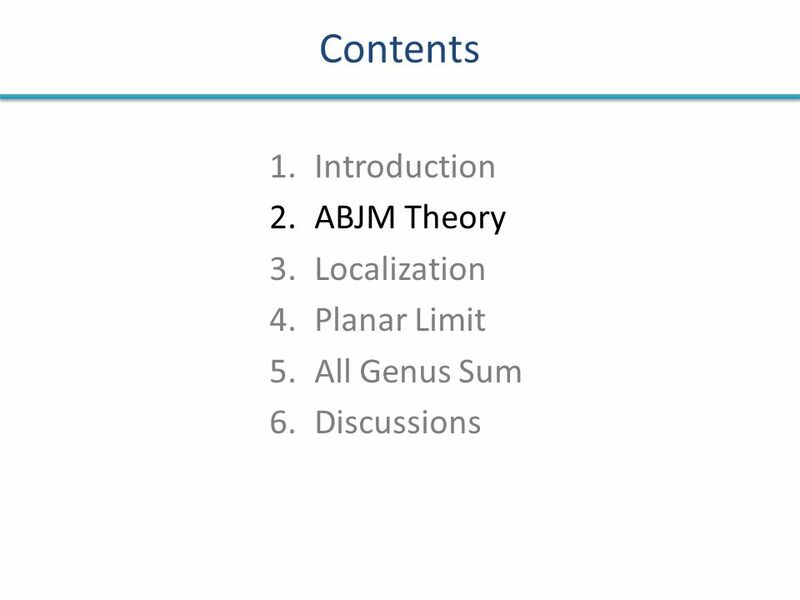 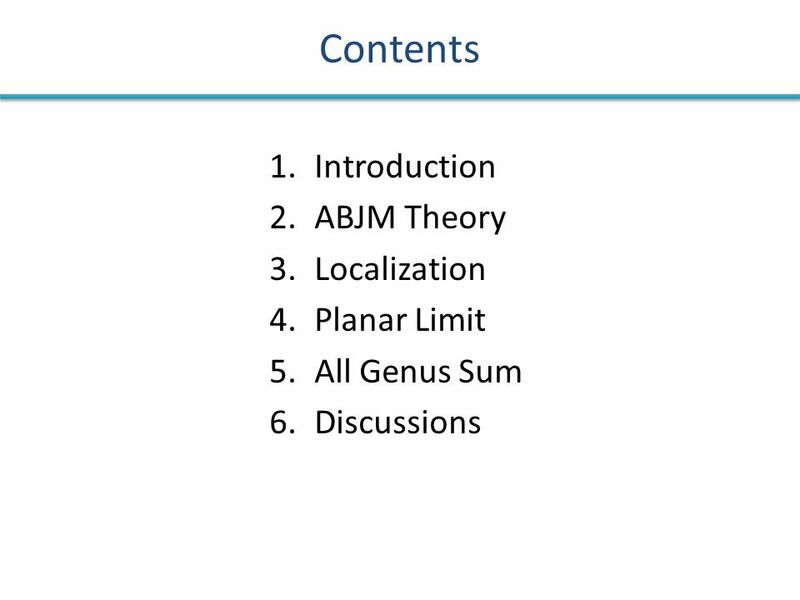 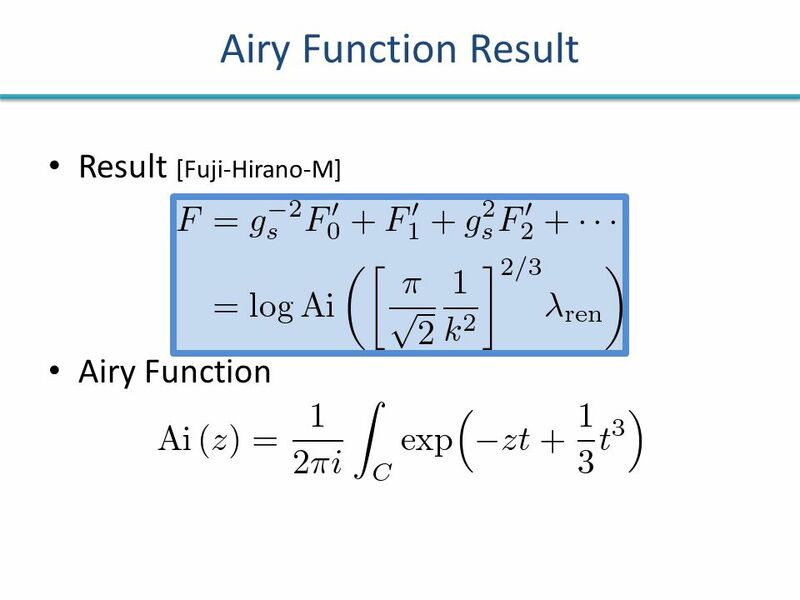 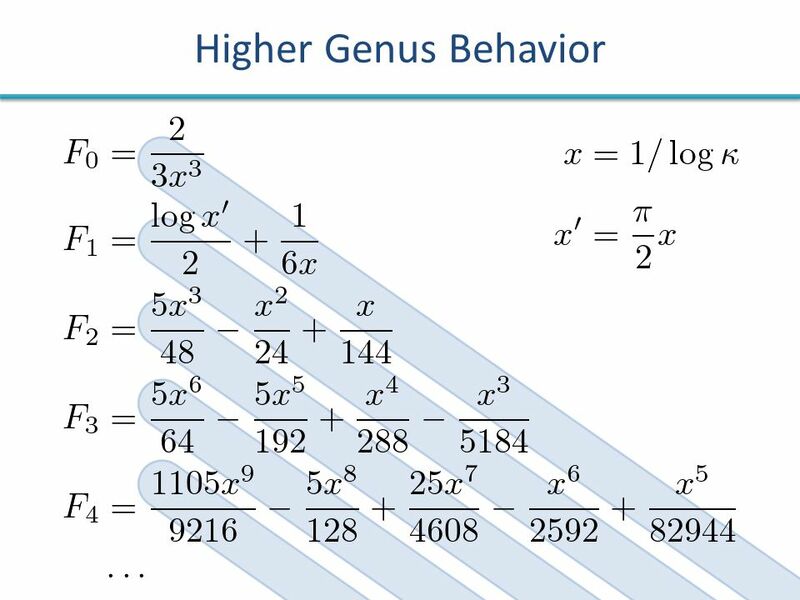 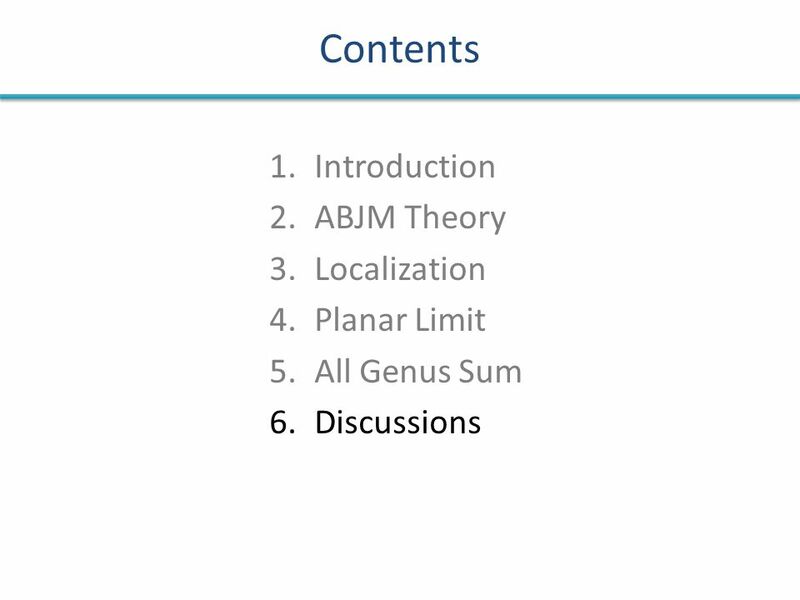 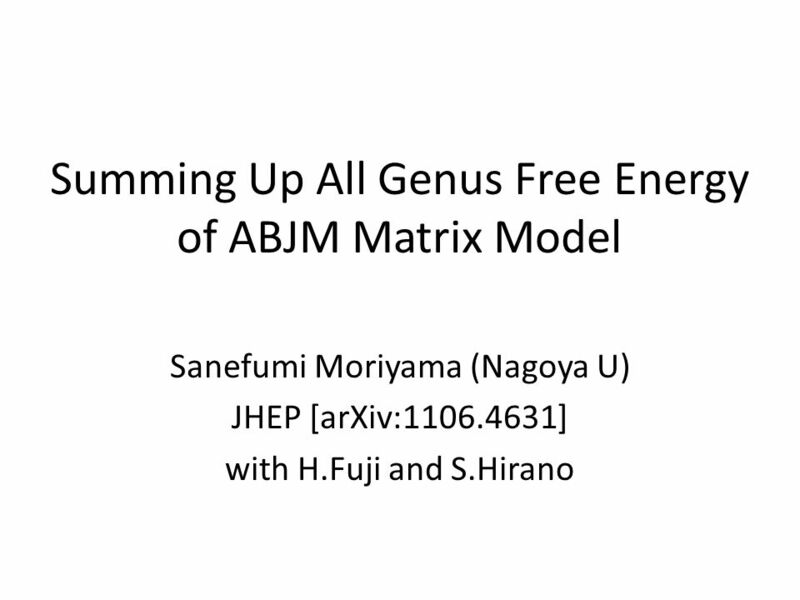 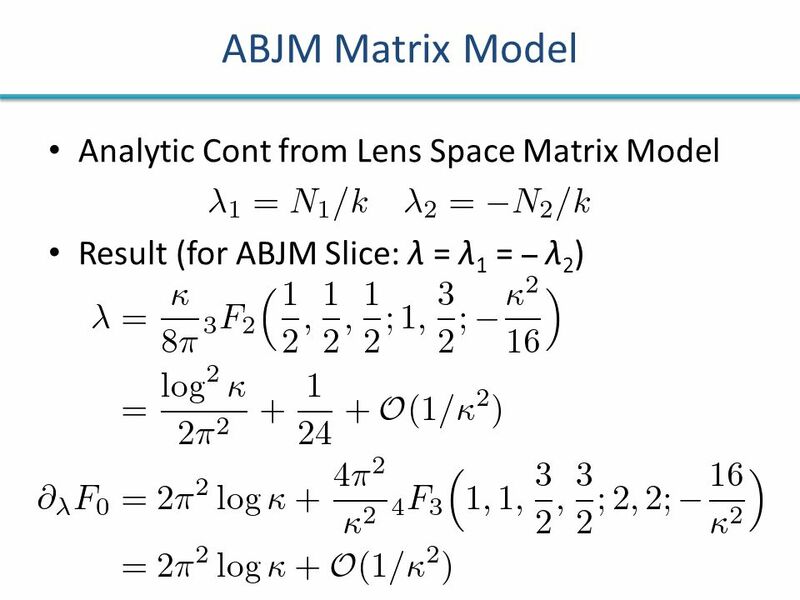 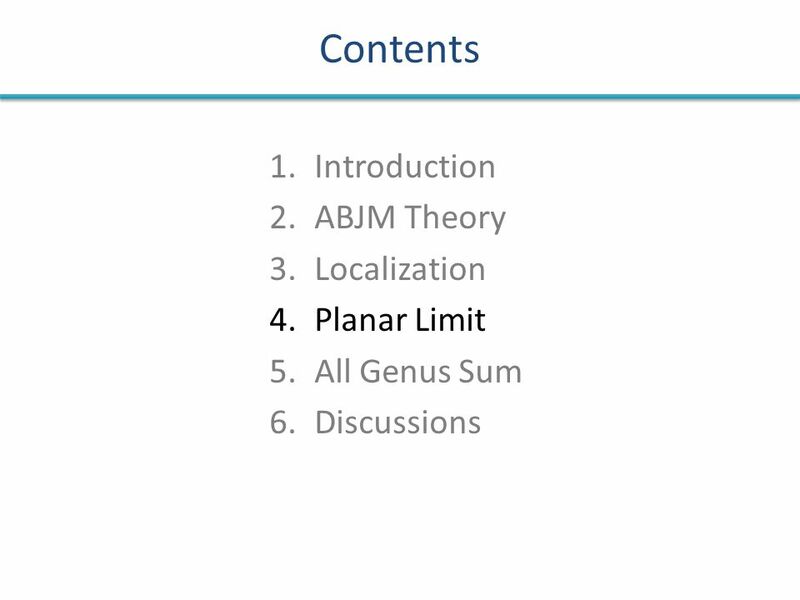 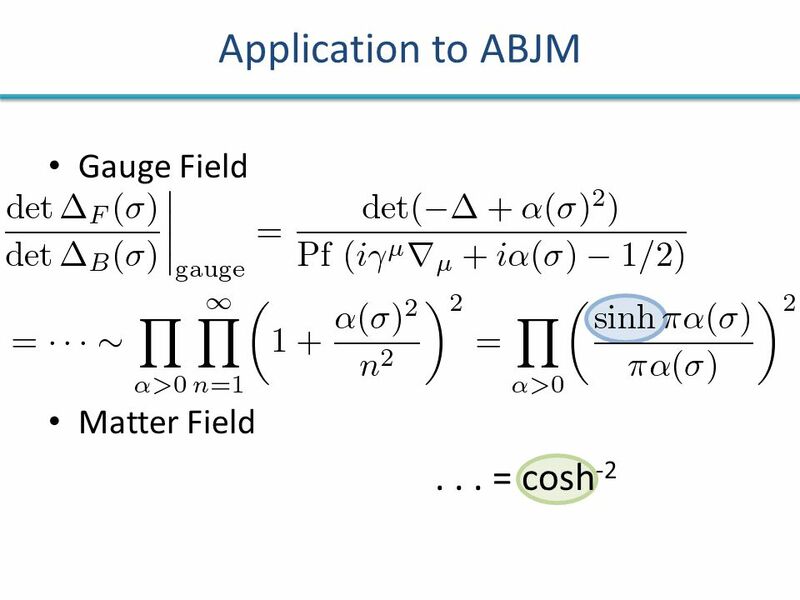 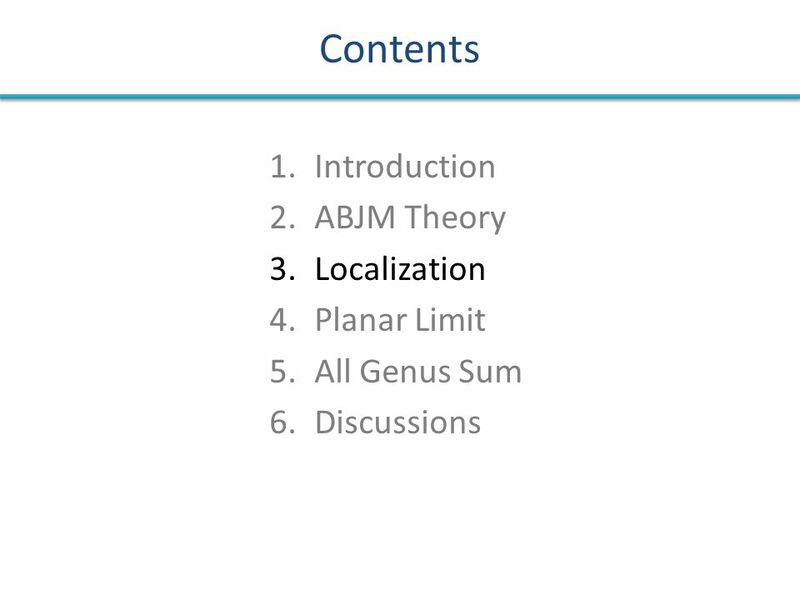 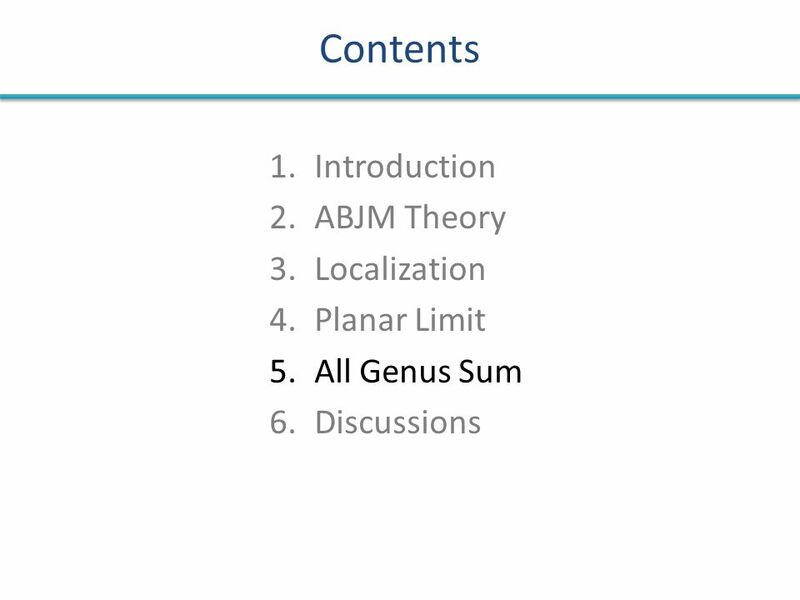 Download ppt "Summing Up All Genus Free Energy of ABJM Matrix Model Sanefumi Moriyama (Nagoya U) JHEP [arXiv:1106.4631] with H.Fuji and S.Hirano." 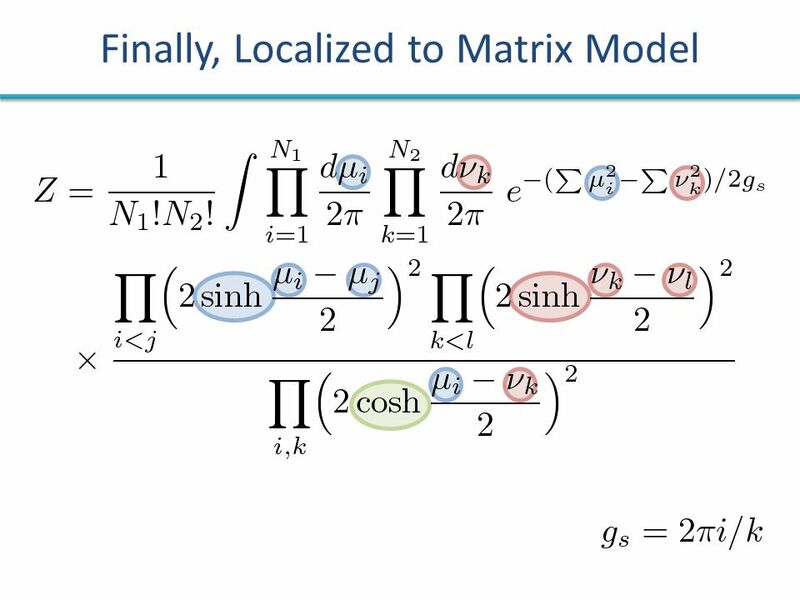 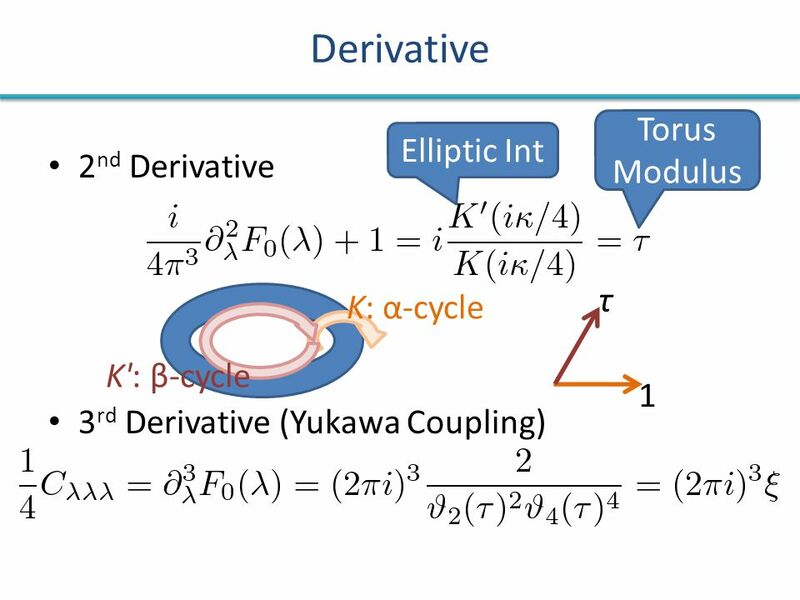 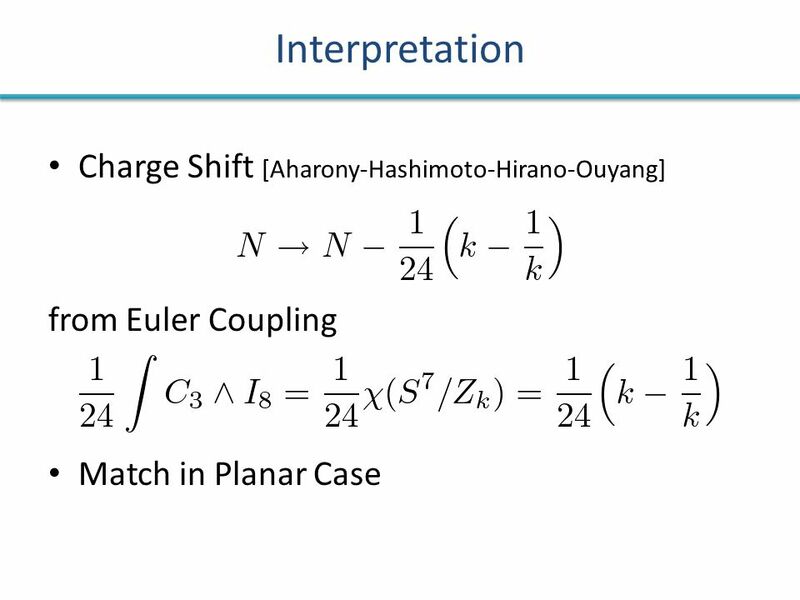 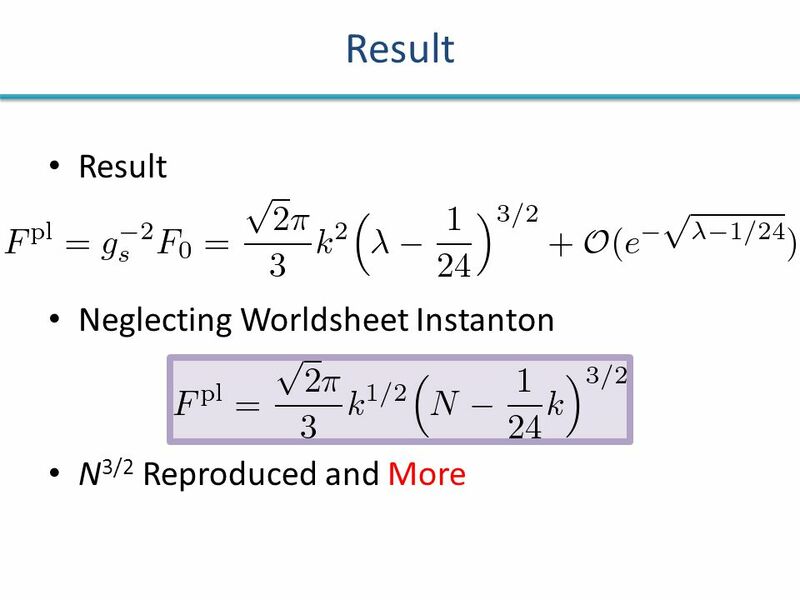 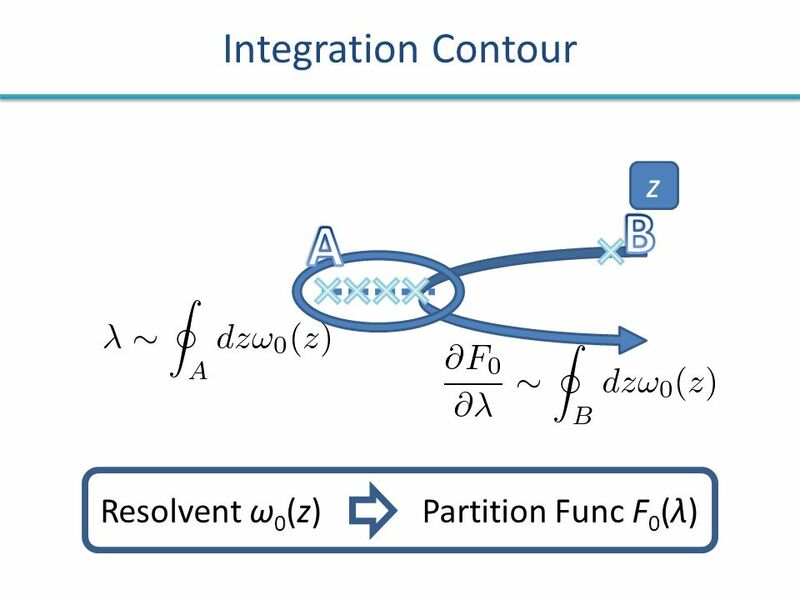 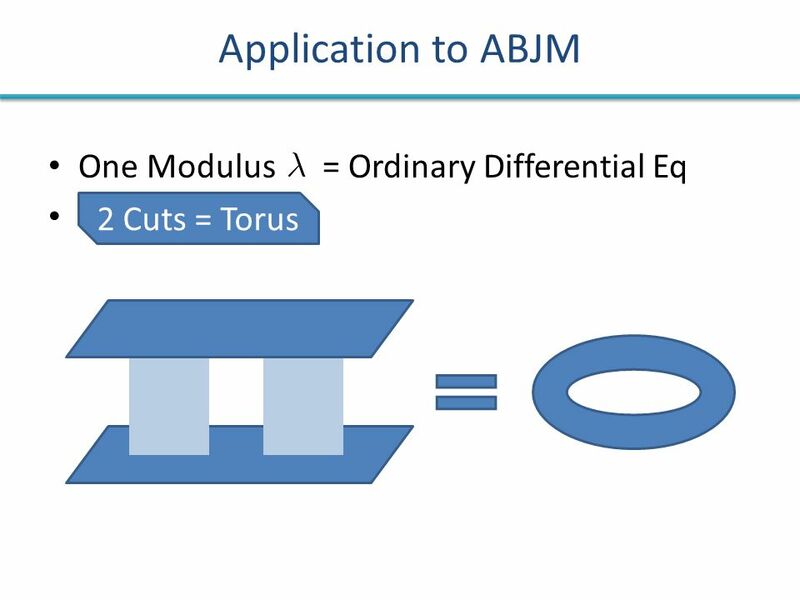 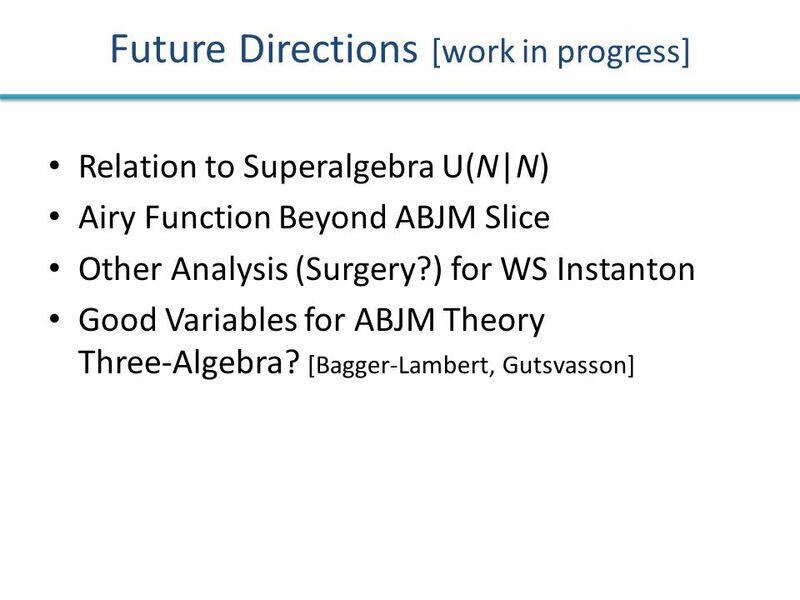 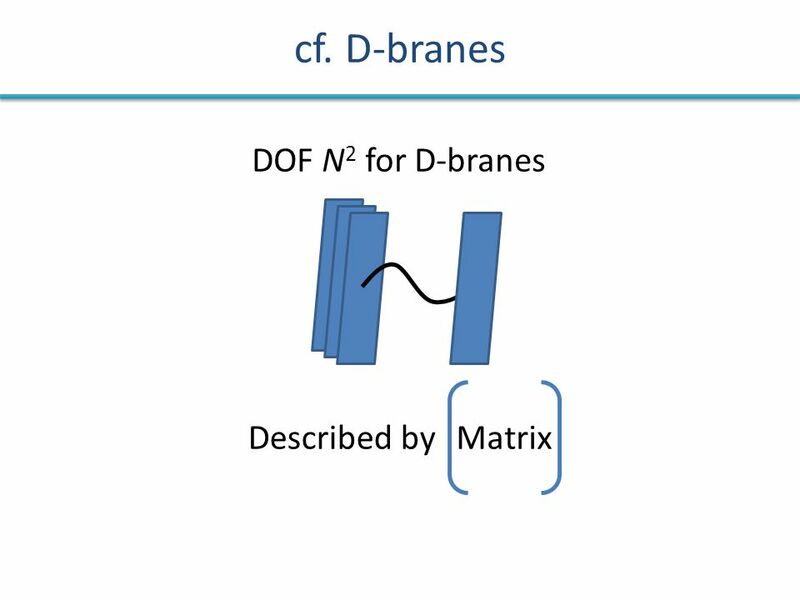 Stokes Phenomena and Non-perturbative Completion in the multi-cut matrix models Hirotaka Irie (NTU) A collaboration with Chuan-Tsung Chan (THU) and Chi-Hsien. 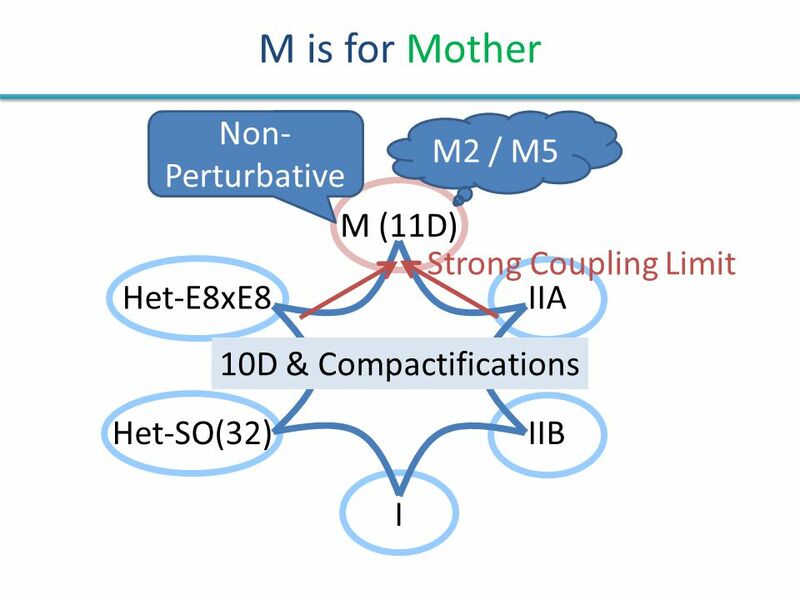 Multiple M2 branes and Nambu bracket Yutaka Matsuo (U. Tokyo) Talk at YITP July 29 th, 2008. 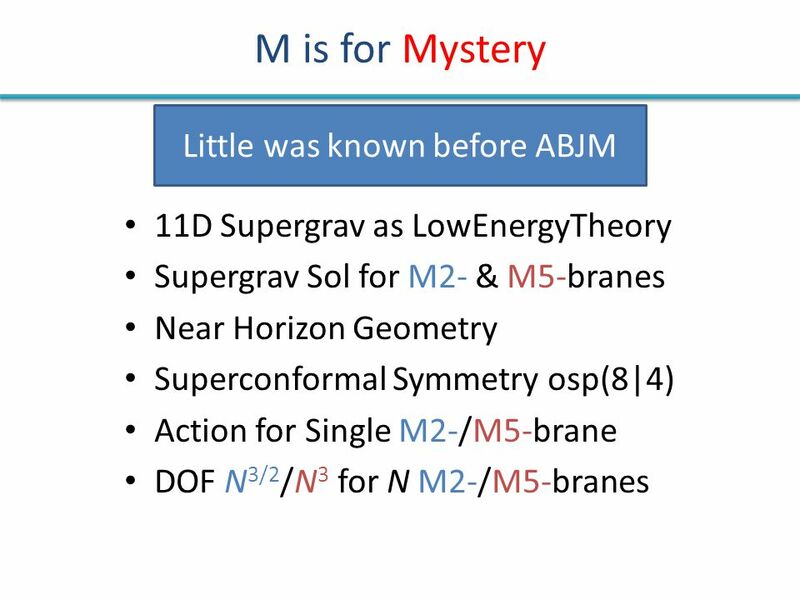 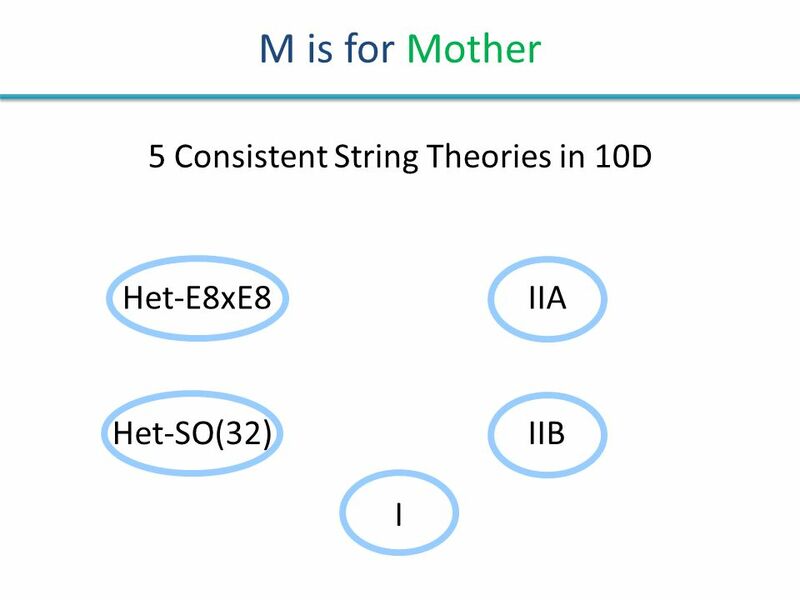 M-Theory & Matrix Models Sanefumi Moriyama (NagoyaU-KMI) [Fuji+Hirano+M 1106] [Hatsuda+M+Okuyama 1207, 1211, 1301] [HMO+Marino 1306] [HMO+Honda 1306] [Matsumoto+M. 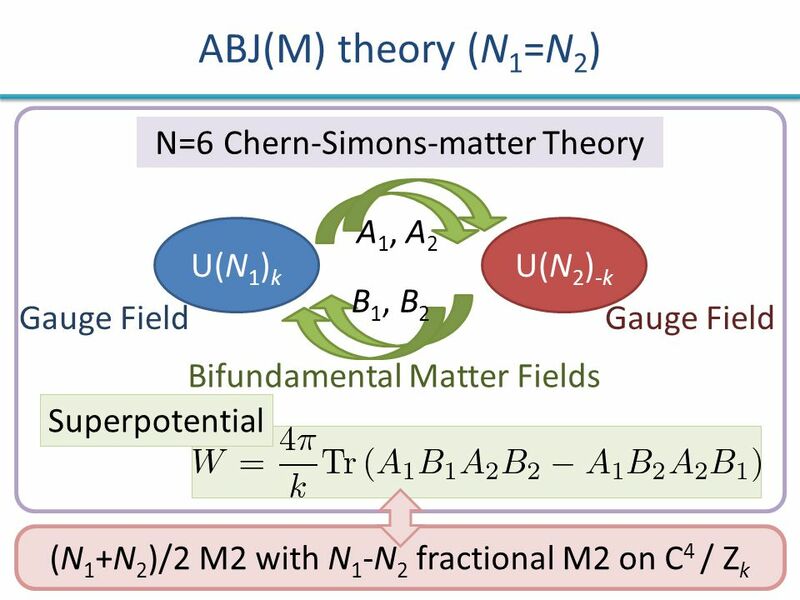 String solitons in the M5-brane worldvolume with a Nambu-Poisson structure and Seiberg-Witten map Tomohisa Takimi (NTU) Ref ) Kazuyuki Furuuchi, T.T JHEP08(2009)050. 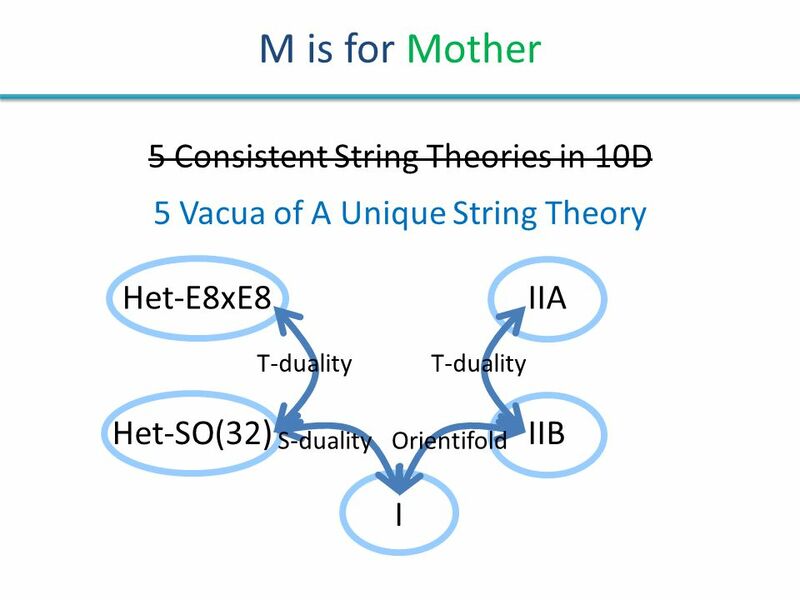 Massive type IIA string theory cannot be strongly coupled Daniel L. Jafferis Institute for Advanced Study 16 November, 2010 Rutgers University Based on. 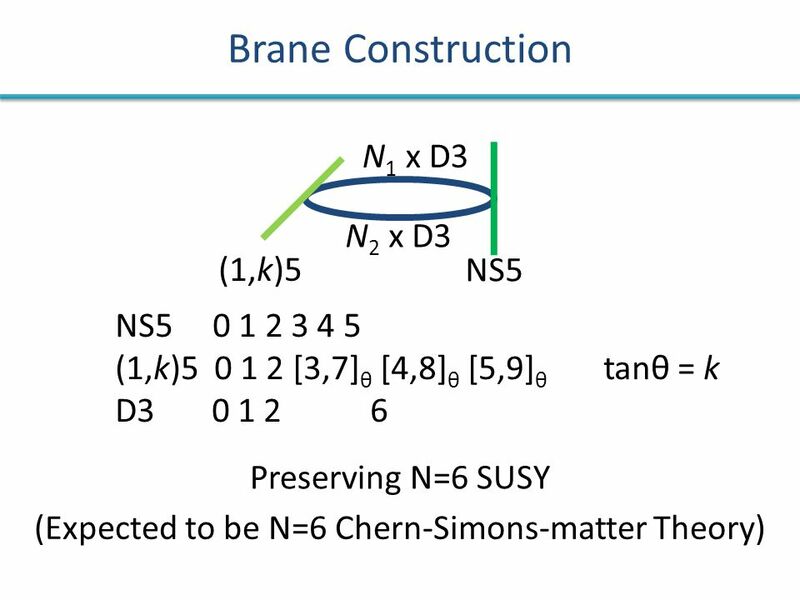 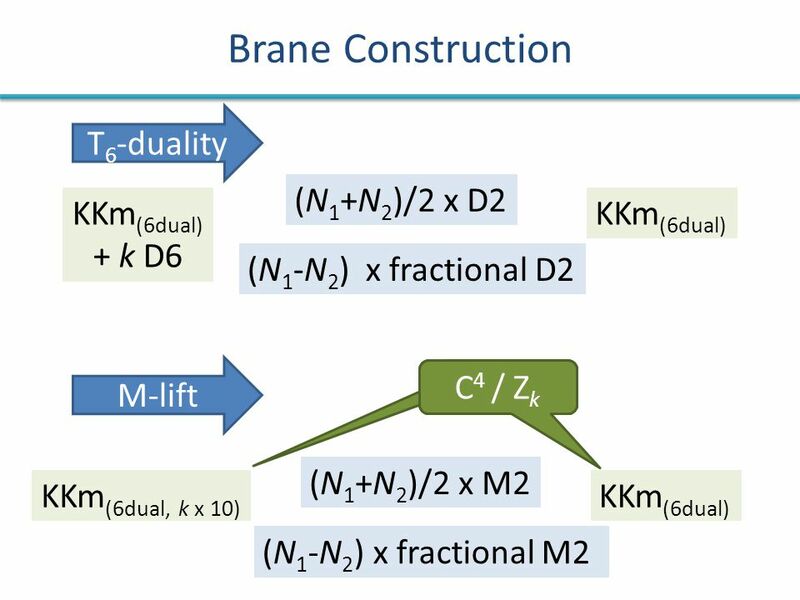 A journey inside planar pure QED CP3 lunch meeting By Bruno Bertrand November 19 th 2004. 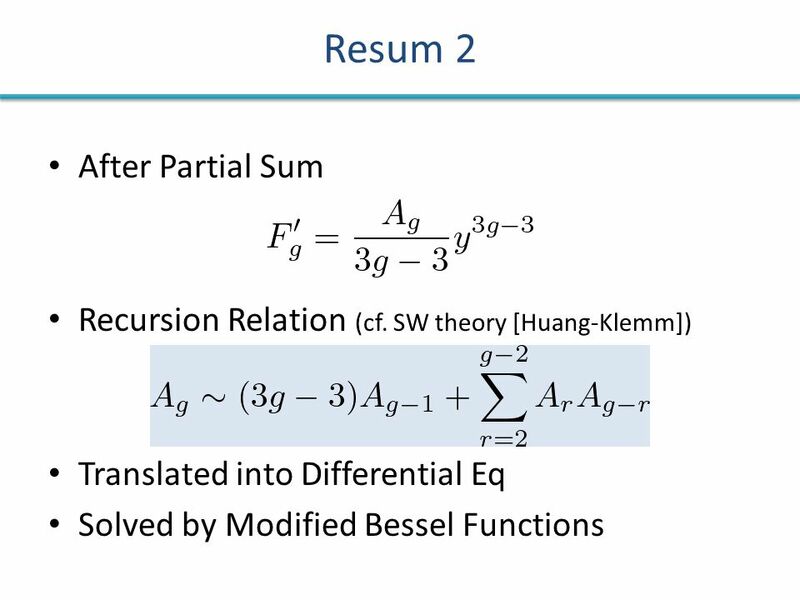 Euclidean Wilson loops and Riemann theta functions M. Kruczenski Purdue University Based on: arXiv: (w/ R. Ishizeki, S. Ziama) Great Lakes 2011.